Merry Christmas, everyone!! :) I truly wish peace and joy to every one of you this holiday season. Thank you all so much for reading this year. I cherish each and every one of your comments! :) I hope you all have a safe and happy holiday. Previous PostFinally! A new recipe! Next Post2 New Themes & How to make your own!
. . . winter colors . . . I hope you’ll get this comment since I’m posting on such an old post, but I love the pictures of your tree and I am hoping you can help me. 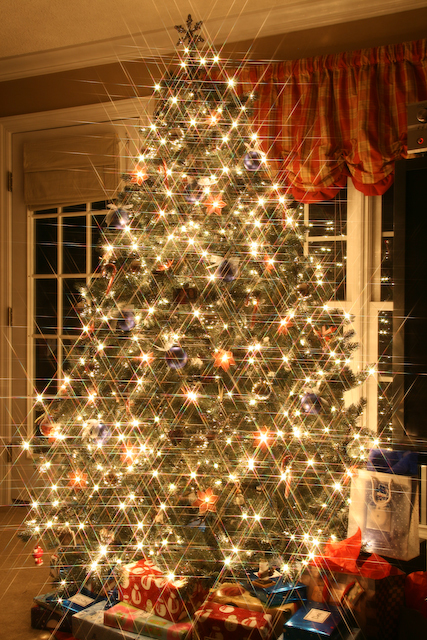 I am taking Santa pictures soon and want to get the look of twinkling lights, but need good lighting for the pictures. Any tips on how to get the sparkly lights with bright lights? oh I meant to say your card is super cute, especially love the striped sweaters! Such creative and fun ideas everywhere on your site!!! You are so clever and so nice to share your creations with us. I’d love to know how to customize my blog and am interested in knowing how and what you used to create your card. Thanks so much, and Happy New Year! Love your card!! I have a gift card holder I made for Christmas on my site as well as some other card type gifts if you want to check it out. I forgot to take a picture of our actual card this year, oh well there’s always next year! Love your blog, your card, your recipes and someday I will get around to sending you my font. Thank you for brightening my day! Love the card! A few days late reading this but our card is on the blog (too lazy to find the link) but the banner is essentially what we sent out if you want to check it out. So classic of my kids! I just wanted to tell you that i love your website you really work hard on it! I love your comments that you share with everyone! I also have a Canon Rebel but do not know much about it. You take such beautiful pics. Thanks for sharing! Merry Christmas! Love the card photos, as well as all of the tree photos. You are just too talented! Merry Christmas.. I love your card… and I LOVE your tree photos? I just could not get a great photo of my tree.. what did you do? I thought that your christmas card is so cute!! how did u make it!?!?! Merry Christmas Amanda and Kevin! May God Bless you both. I just love your website and all the wonderful tips that you share. Great Christmas card and pictures. May you have a wonderful New Year! Merry Christmas to Howie and Miley also! I hope that you and Kevin (and Miley and Howie) have a wonderful Christmas! 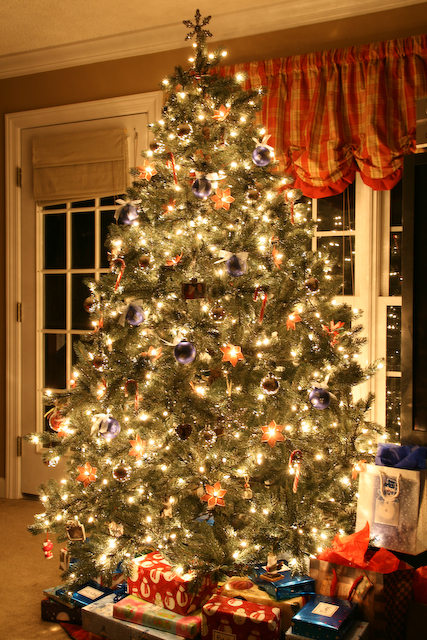 I Love your Christmas card and your Christmas tree is beautiful! You can see my Family Christmas card on facebook…I added you on mine a couple days ago. :D I don’t have a blog yet. Merry Christmas!! Love your tree! Beautiful family picture! Here is a link to my Christmas Letter on my blog. Click on the letter to enlarge. Love the tree! Thanks for all you share with us! wow….that knocked my socks off…can’t wait until it get dark outside so we can try you camera “trick” ourselves… You are WAY too talented…thanks for sharing! Merry Christmas! Great card and pics of the tree. Hope you and Kevin and Miley & Howie have a great Christmas! Amanda love your Christmas card very cute!!!! Great card and beautiful tree photos – thank you for sharing them. Merry Christmas and Happy New Year to you, Kevin, Miley and Howie! Love the card and the tree! Love your tree!! I wanted to tell you that I tried the recipe for The BEST chocolate cake and got rave reviews (the men especially liked it) Thanks for posting such good and easy recipes….my daughter swears by your recipe for the marinated grilled chicken! Wow! Love the Christmas tree pics and how you, hubby and the dogs match. Too cute!!! Merry Christmas! 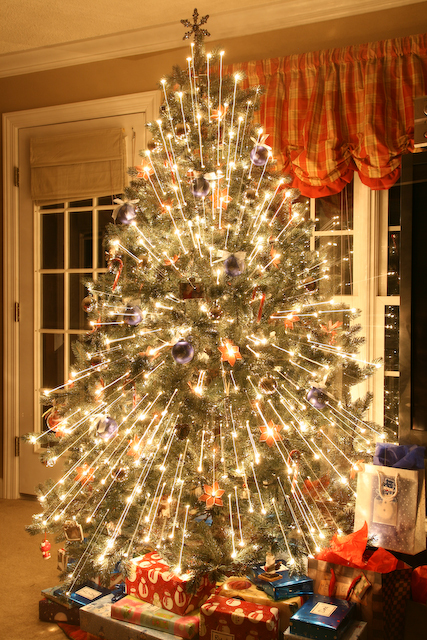 I love the tree light pictures…so pretty. I tried this to but it didn’t come out as cool as your’s. Our card is here. My tree light pictures here. Beautiful card! And I love the pictures of your tree! I’ll have to try that zoom technique. Your card is gorgeous, love the coordinated outfits! And your tree pics are amazing! Wow what a card and thank you for sharing your joy with the rest of us. You both are great and so are Miley and Howie. Love and Have a Great and Wonderful Christmas. Hope you don’t mind us sharing your website.